Abstract: Zircon populations from the Roznava Formation volcanic rock complex have been analysed. Euhedral zircons from the 1st volcanogenic horizon with fine oscillatory growth zoning, typical of magmatic origin, gave the average concordia age of 273.3±2.8 Ma, with Th/U ratios in the range of 0.44–0.73. The Permian ages ranging from 266 to 284 Ma were identified in the wider, zoned or unzoned, central zircon parts, as well as in their fine-zoned oscillatory rims. The average concordia age of 275.3±2.9 was obtained from the euhedral zircon population of the 2nd volcanogenic horizon of the Roznava Formation. The analyses were performed on zoned magmatic zircons in the age interval from 267 to 287 Ma, with Th/U ratios in the range of 0.39–0.75. In the later zircon population two inherited zircon grains were dated giving the age of 842±12 Ma (Neoproterozoic) and 456±7 Ma (Late Ordovician). The magmatic zircon ages document the Kungurian age of Permian volcanic activity and contemporaneous establishment of the south-Gemeric basin. The time span of volcanic activity corresponds to the collapse of the Western Carpathian Variscan foreland which expanded southward. Abstract: We describe the extinct cockroach family Fuziidae fam. nov., represented by Fuzia dadao gen. et sp. nov. from the ?Bathonian (168 Ma) Middle Jurassic sediments of Daohugou, Inner Mongolia, China. Males are characterized by unique, long and narrow bodies with a notch on forceps of earwig-like cerci, which attaches to the long external ovipositor during courtship. In a combination with the presence of male tergal glands, it appears the most advanced form of reproduction in the nearly 300 Myr history of long external ovipositor-bearing cockroaches. Its advanced morphology significantly supports attribution of living and fossil cockroaches within a single order Blattida. Abstract: According to earlier concepts, the Czorsztyn Unit (Oravic Superunit, Pieniny Klippen Belt, Western Carpathians) sedimented on the isolated Czorsztyn Swell which existed in the Middle Jurassic–Late Cretaceous time in the realm of the Outer Western Carpathians. This paper brings new data providing an alternative interpretation of its Cretaceous evolution. They are based on heavy mineral analysis of the Upper Aptian/Lower Albian sediments of the Czorsztyn Unit. They rest upon a karstified surface after a Hauterivian-Aptian emersion and are represented by condensed, red marly organodetritic limestones with some terrigenous admixture (Chmielowa Formation). The heavy mineral spectrum is dominated by spinels, followed by garnet, with lesser amounts of zircon, rutile and tourmaline. The composition of the majority of the detrital garnets shows that they were derived from primary HP/UHP parental rocks which were recrystallized under granulite and amphibolite facies conditions. The garnets were most probably derived directly from the magmatic and metamorphic rocks of the Oravic basement, as the high-pyrope garnets are known to be abundant in Mesozoic sediments all over the Outer Western Carpathians. The presence of spinels is surprising. According to their chemistry, they were mostly derived from mid-oceanic ridge basalts (MORB) peridotites, supra-subduction zone peridotites (harzburgites) and transitional lherzolite/harzburgite types. Only a lesser amount of spinels was derived from volcanics of BABB composition (back-arc basin basalts). The presence of this ophiolitic detritus in the Czorsztyn Unit is difficult to explain. Ophiolitic detritus appeared in the Aptian/Albian time only in the units which were considered to be more distant, because they were situated at the boundary between the Central and the Outer Western Carpathians (Klape Unit, Tatric and Fatric domains). The hypothetical Exotic Ridge which represented an accretionary wedge in front of the overriding Western Carpathian internides was considered to be a source of the clastics. In previous paleogeographical reconstructions, the Czorsztyn Unit was situated north of the Pieniny Trough (considered to be one of the branches of the Penninic-Vahic Ocean). In the trough itself, the ophiolitic detritus appeared as late as in the Senonian and there was no way it could reach the Czorsztyn Swell which was considered to be an isolated elevation. The new results presented herein show that these reconstructions do not fit the obtained data and infer a possibility that the Czorsztyn sedimentary area was not isolated in the Cretaceous time and it was situated closer to the Central Carpathian units than previously thought. A new paleogeographical model of the evolution of the Pieniny Klippen Belt is presented in the paper: Oravic segment was derived from the Moldanubian Zone of the Bohemian Massif by the Middle Jurassic rifting which caused block tilting where most of the Oravic units were arranged north of the Czorsztyn Swell. The Oravic segment was situated in the lateral continuation of the Central and Inner Western Carpathians from which it was detached by later clockwise rotation. The Oravic segment was then laterally shifted in front of the Central Western Carpathians, together with remnants of the Meliatic suture zone which represented a source for the exotics to the Klape, Tatric, Fatric and Oravic units. Abstract: In structurally complicated terranes with outcrops limited in number and extent, additional methods for interpreting depositional environments are required. Statistical analysis of bed thicknesses, in addition to conventional sedimentological analysis, is a quantitative way to refine environmental interpretations, interpretations that can be useful in predicting reservoir architecture. 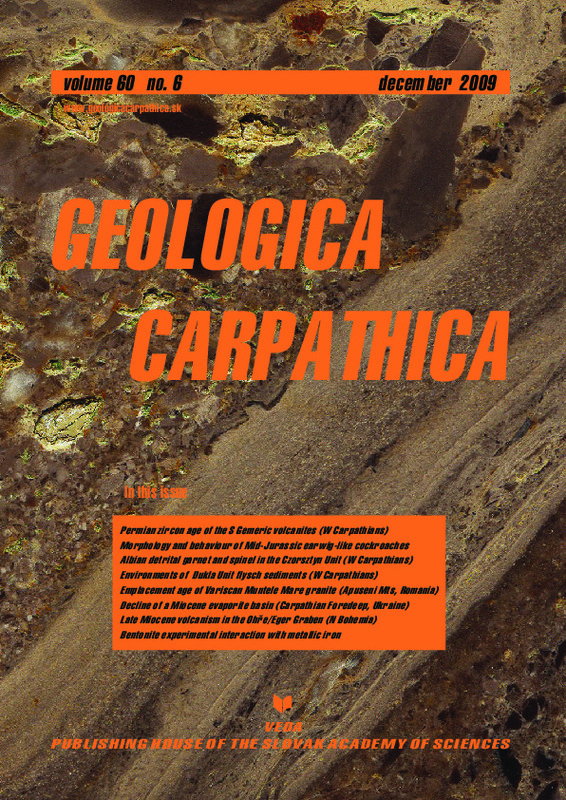 We analysed Paleogene deep-water sediments belonging to the Cisna, Sub-Menilite, and Menilite Formations of the Dukla Unit, Outer Carpathian Flysch Zone and, using two independent quantitative methods, tried to define their depositional environments. As a first approach we used Carlson & Grotzinger’s model (2001), which suggests power law distribution of turbidite bed thicknesses. The second one is the lognormal mixture model of Talling (2001). Based on a quantitative approach, we suggest deposition of the lowermost Cisna Formation in the channel-levee environment. The overlying sediments of the Sub-Menilite Formation were deposited in a more distal, probably outer lobe environment. The uppermost Menilite Formation is interpreted as deposits from an outer lobe/basin plain environment. Abstract: Like the Alps and Western Carpathians, the Apuseni Mountains represent a fragment of the Variscan orogen involved in the Alpine crustal shortenings. Thus the more extensive Alpine tectonic unit in the Apuseni Mountains, the Bihor Autochthonous Unit is overlain by several nappe systems. During the Variscan orogeny, the Bihor Unit was a part of the Somes terrane involved as the upper plate in subduction, continental collision and finally in the orogen collapse and exhumation. The Variscan thermotectonic events were marked in the future Bihor Unit by the large Muntele Mare granitoid intrusion, an S-type anatectic body. Zircon U-Pb laser ablation inductively coupled plasma mass spectrometry (LA-ICP-MS) dating yielded a weighted mean age of 290.9±3.0 Ma and a concordia age of 291.1±1.1 Ma. U-Pb isotope dilution zircon analyses yielded a lower intercept crystallization age of 296.6+5.7/–6.2 Ma. These two ages coincide in the error limits. Thus, the Muntele Mare granitoid pluton is a sign of the last stage in the Variscan history of the Apuseni Mountains. Many zircon grains show inheritance and/or Pb loss, typical for anatectic granitoid, overprinted by later thermotectonic events. Abstract: The Kudryntsi section in West Ukraine documents a major environmental change from hypersaline to marine conditions during the Middle Miocene. There are very few (or no) specimens of foraminifers in samples of the siliciclastic series (4 m thick, with limestone intercalations) which occurs above the gypsum (and below the transgressive deposits) in the southern part of quarry. The limestone intercalations are first sparitic and microsparitic, and then become pelletal. The pelletal depositional textures are interpreted as originated in restricted environments in contrast to mixed-fossil lithoclastic packstones/grainstones overlying the siliciclastic series. The diversity of fauna increases up section. Foraminifers, bivalves, ostracods and gastropods appear first and then, additionally, brachiopods, bryozoans, crinoids, and echinoids occur. Foraminiferal assemblages are dominated by elphidiids forming 70 to 90 % of the population. The most common species are Elphidium crispum (Linne) and E. macellum (Fichtel & Moll). The limestones show a wide range of δ13C values (from –1.6 ‰ to –18.2 ‰) and δ18O values (from –0.2 ‰ to –9.4 ‰) indicating that the cementation and some recrystallization took place in meteoric-water-dominated fluid but the restriction-controlled trend can be recognized. The siliciclastic series was deposited in an evaporitic lagoon influenced by large inflows of continental waters carrying the siliciclastic and other detrital material from the older Badenian rocks as well as from their substrate. The Kudryntsi section documents a step-wise decrease in water salinity — from ca. 150–300 ‰ during the Badenian gypsum precipitation, through ca. 80–150 ‰ during deposition of the siliciclastic series to ca. 35 ‰ during sedimentation of the basal transgressive deposits. The basal deposits originated in shallow subtidal (0–20 m) environments of normal marine salinity (30–35 ‰) and temperate to warm waters (8–18 °C) as indicated by requirements of the E. crispum association in recent seas. Abstract: First occurrences of superficial bodies of Late Miocene volcanic activity were found in the western part of the Ceske stredohori Volcanic Complex (CSVC) and extended our knowledge of its volcanostratigraphy. Their K-Ar ages (9.59, 9.61 and 11.36 Ma) correspond to the age of alkaline basaltic rocks of the youngest known Intrusive Suite of this area. Unlike the previously known subvolcanic bodies of this system, the newly observed bodies are represented by superficial products: two scoria cones with remnants of lava flows and one exclusive lava flow produced from a lava cone. The magmas forming all three occurrences are basanitic. Their primitive chemical composition Sr (0.70347–0.70361) and Nd (0.51279–0.51284) isotope ratios are similar to the products of the first and third volcanic formation of the CSVC. The proved existence of superficial products of the youngest volcanic formation, together with clear superposition relations to sedimentary formations and the chemical character of the youngest magmas in the central part of the Ohre (Eger) Graben support the stratigraphic scheme of volcanic activity in the Ceske stredohori Mts. The eruptive style of the youngest formation volcanoes was purely magmatic (Strombolian) with no phreatic influence. Abstract: The experimental stability of four bentonites and one K-bentonite from Slovak deposits in the presence of iron was studied to simulate the possible reactions of clays (bentonite barrier) in the contact with Fe containers in a nuclear waste repository. The batch experiments were performed at 60 °C for 30 and 120 days in aerobic conditions. The reaction products were examined by XRD, FTIR, and Mössbauer spectroscopies and CEC (cation exchange capacities) were determined. Reaction solutions were analysed for selected elements using AAS (atomic absorption spectrometry). The results show that bentonites do not interact equally with metallic iron. Bentonites from the Jelsovy Potok, Kopernica and Lieskovec deposits reacted similarly whereas the interaction between the bentonite from Lastovce and the iron was less intensive. The lower reactivity of the bentonite from Lastovce can be explained by its low content of smectite. During iron-clay interactions the iron was consumed and Fe oxides (magnetite, lepidocrocite) were formed. Decrease of the smectite diffraction peaks intensity and CEC values during the experiments show rather the rearrangement of the original smectite crystals than dissolution of smectite. In the K-bentonite from the Dolna Ves deposit where the mixed-layer illite-smectite is present instead of smectite, the dissolution of illite-smectite was observed along with the neoformation of smectite. The structure of illite-smectite deteriorated more than the structure of smectites which suggests that this mixed-layer illite-smectite is much less stable in the presence of iron than smectites.